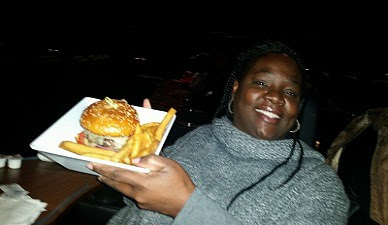 Those that follow me on social media know I often bring whole meals into the movie theater, take a picture before the movie starts and tag them #CinemaSneaknSnacks. The thing missing from my enjoyment of my smuggled edibles is a hard surface in which to eat. So ideally, I'd love to go to Studio Movie Grill with my own food and happily use the little dining desk which comes with each seat. Of course that wouldn't be fair to the staff depending on food sales, nor would it be easy to get away with, as the servers are in and out of the aisles all during the movie. I have a male acquaintance who sees probably more movies than I do, we've gotten friendly over the last year or two. I've given him a ride home on several occasions. Sometimes he gets screening passes through T&T offers. So it was nice of him to invite me when he won free passes to Studio Movie Grill. He reminded me several times to pick a movie and date to go, that he'd save the passes until I could go with him. 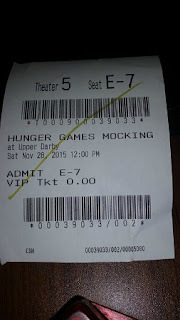 Finally, both having missed the preview screening of Hunger Games Mockingjay Part 2, we decided to see it over the Thanksgiving weekend. I'm not one to do much hanging out at 69th Street in Upper Darby, so I was a little worried about parking, but there is a Free lot behind the theater. I dropped my "date" who we'll call W off in front of the theater and made my way around the back. In the light of day it wasn't too bad, but I have to say, I'd be scared to park back there on my own at night. The Studio Movie Grill itself is deluxe though, great looking marquee out front and modern, state-of-the-art dark interiors. The theater only opened in July, so everything still feels pretty new. We got there at 11:30am for a noon screening, so we had the pick of the best seats in the house which have to be reserved when you purchase a ticket in person or online. I had perused the menu online back in July when I missed the opening press event (see original post below) but now I went over it again, it's a traditional pub menu, appetizers of: chicken wings, mac n cheese, pretzel bites, loaded potato skins etc... and entrees of pizzas, burgers, Tex Mex, ribs etc... Prices are about $2-3 more for everything than your average pub. There's a number of specialty cocktails to choose from and a larger wine and beer selection than I would think necessary. The 2 for $25 special seems to be the best deal, as you get a starter and 2 entrees. But W said he only wanted a soda, so I ordered al a carte California Burger with avocado & pepper jack cheese which comes with fries for $11.50. Most people want a shake, beer or soda with a burger and fries, but I love it with coffee! And I hadn't had any that morning so I was really looking forward to the combo. Only my waiter warned me their coffee is terrible. I said, "How terrible? Is it very weak?" He replied, "It just tastes weird." I started to take his word for it, but I thought, I've had bad coffee before, it should still be drinkable. Well, it's NOT!!! It tastes like 40 year-old decaf Sanka. And it costs $4.00! I've never had such bad coffee in my life! I should have just sent it back, but that's just how much I felt like drinking coffee. Instead, I did complain that it was cold. The server picked it up and felt the bottom and said, "it doesn't seem that cold to me." My response, "It's less than tepid. Would you please nuke it?" She looked at me unsure and hesitantly said, "I'll see what I can do", and left the coffee. Now what does that mean? Cause there's only 1 of 2 things you can do when someone says their coffee is cold - You go and get a fresh, hot cup or you heat up the offending cup. I wait 10 minutes, no one returns, so I hit the red button and the next server (3rd one) comes and I tell her, my coffee came cold, she does take it and heat it up, but it's still terrible. Meanwhile, W decides to order a burger, so now we could have just done the 2 $25 deal. But I'm not really worried about it cause, he invited me, the tickets were free, I drove. Surely he's picking up the tab, right? Back to the food review: The California burger was fine, but the roll was kinda crumbly and fell apart easily, that usually means it's not very fresh. Not real happy with the fries, too hard, too big, not very crispy. I'd pay the extra $1 to try the sweet potato fries next time. But everything did come before the movie started. I'd like to return on a Wednesday to try the Endless 1-topping Pizza deal for $10. Back to Studio Movie Grill Review: I don't like that the bill gets delivered during the climax of the movie. I saw W pick up the bill and look it over and push the button, so I was glad he was handling it so I could enjoy the movie. Not so, he noticed that a salad we didn't purchase was on the bill. Next, I also get a black check holder placed on my desk. I thought it strange they automatically assumed we wanted separate checks, but then W says, my food is on his check too. Double bills, huh? So we push the red button, explain to the server about the double billing. They bring back one check, but W notices they've charged him $21 for his burger! Now, all this is happening as Katniss is approaching the Capitol and bombs are going off everywhere. This is not the time to be putting on my magnifying specs and looking over the bill for mistakes. I also noticed the gratuity is already added to the bill, which is fine, but there's still a line when you sign the check to place a tip. I'm kinda thinking, if you're signing in the dark, not wearing your reading glasses, and you're watching the movie, it makes it really easy to mistakenly pay an inflated total and double tip. Maybe it was just a one time error. The servers and staff were all basically friendly and seemed earnest, but they are all high school, maybe a few college age, I didn't see any adults on staff, but I'm sure there's a over 21 manager somewhere. Recommendation: I think instead of taking our orders and serving a check near the end of the movie. 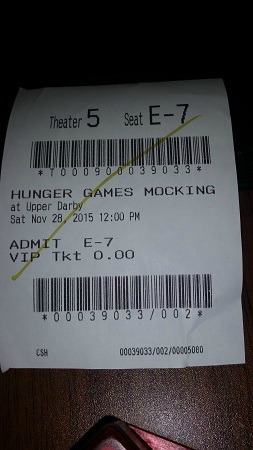 We should order both the movie ticket and food/drink at a Kiosk before sitting down. 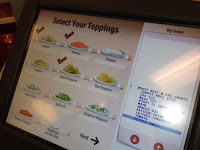 Kinda like the touch screen ones they have at Wawa, but this kiosk should take money & credit cards. Then your food is brought to your seat, but the bill is already paid. Just a suggestion. 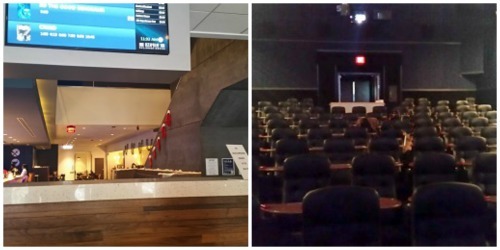 ORIGINAL POST 7/23/15 I write a food and film blog and yet I've never been to the Movie Tavern in Collegeville. I know, ridiculous, right? But I see free movies as press so.... and over the years, I've gotten in the habit of having movie posts and foodie posts, but it's not too often it's a food and film post, although today it is because the Movie Tavern now has competition - STUDIO MOVIE GRILL (55 S. 69th Street, Upper Darby, PA 19082) opened its doors today! (7/23/15) And guess what? I can't make it for the press event, street celebration and film cutting ceremony - well, I took off Tuesday to go to the beach, so I can't take off another day this soon, and I have my last summer Bible study class early evening... 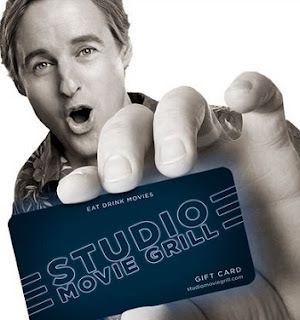 But I do look forward to checking Studio Movie Grill out very soon and reporting on my experience, in fact, and nobody steal my idea, I'll go to both food and film spots and do a comparison post! 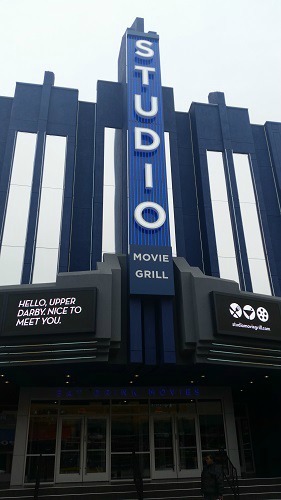 About Studio Movie Grill: SMG Upper Darby’s state-of-the-art theatre complex will be Studio Movie Grill’s twenty-first location to date and the first in the Northeast. Additional sites are planned. Established in 2000, by CEO and Founder Brian Schultz, SMG has swiftly grown to 21 locations in ten states. These new locations will add over 50 screens, and expand operations ranking Studio Movie Grill the 20th largest exhibitor in the U.S. SMG modernized the traditional movie-going experience by combining first-run movies with in-theater dining and is characterized in the market today by its continued ability to innovate and maximize movie and menu offerings. For additional information, please visit www.studiomoviegrill.com. Select from first-run movies or our alternate programming series. Reserve your seats online for the best experience or stop by the box office. Visit our bar and lounge areas to grab a drink and socialize before or after the show. Enter the theater 20 minutes beforehand to order your food and beverages. Press the call button at your seat and a server will arrive to take your order. Your food and beverage order will be served at your seat. Order as much and as often as you like throughout the show. Your server will deliver your check before the movie ends.